Shanghai Zenith Mining and Construction Machinery Co. Ltd has devoted itself to creating the B6X series belt conveyors closest to user demands proceeding from the concept of both saving customers’ investment and providing customers with stable products in performance. As the most streamlined conveyors in the market, the B6X belt conveyors are no doubt representing today's most advanced technology. Only conveying materials is not complicated, because when users are universally concerned about product quality, performance and investment, B6X series belt conveyors have also achieved convenient installation, simple maintenance, energy conservation and environmental protection, as well as the high-end manufacturing technology, attractive appearance and high security, which can satisfy the requirements for high standard transportation of all kinds of bulk materials. In order to reduce the difficulty of users’ on-site installation and operation, shorten the period of installation and maintenance, the design of the B6X series belt conveyors has emphasized the high universality and interchangeability as well as more simple installation and fewer maintenance points. 1、The frame adopts a modular design, whose standard headstock, tailstock and intermediate frame are connected by bolts and taper bevels, and a modular side guard is also equipped, so the equipment can be conveniently installed and transported, as well as simply and reliably connected. 2、The supporting racks adopt a “toe-out” construction and are installed and welded with circular pipes, equipped with a universal coupling base subject to slotted dowel pin shaft connection, and the legs can be adjusted according to installation angle, so it can achieve large blanking space. The chassis main beam adopts a C type steel structure including the upper and lower support beams and equipped with side guard plates, so the chassis features a large section size and high overall strength; the complete machine adopts finite element analysis and the overall stress design is very reasonable so as to meet the load requirement under complex stress conditions and achieve more reliable operation. The headstock uses a motor to drive the cycloid speed reducer and consequently drive the driving drum, featuring stable and reliable running and convenient maintenance; the tailstock uses small-sized turnabout drums, optimized tensioning and material collecting devices, and sweepers, so it can achieve a compact structure and a small installation size, thus facilitating installation and material collection. The excellence of B6X series belt conveyors stems from its design and manufacturing technology, and even the smallest details have been perfected to ensure the strongest function and the highest reliability and security of equipment. The B6X belt conveyors adopt finite element dynamic simulation analysis and the overall stress design is so reasonable that it can satisfy the load requirements under complex stress conditions and achieve more reliable operation. 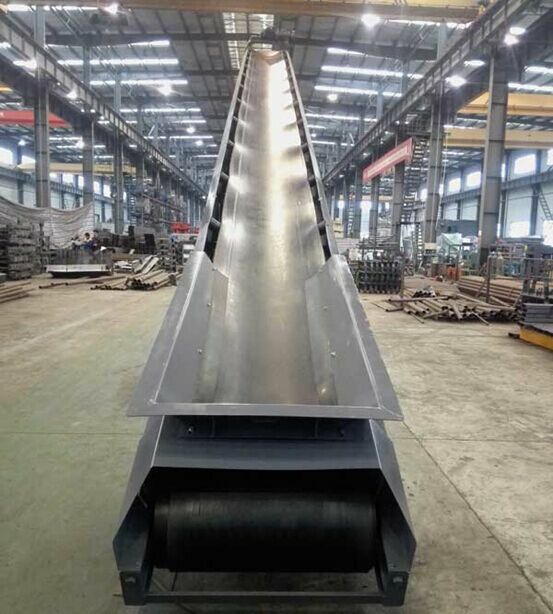 The side guard plate design of B6X can not only play the role of an installation roller, but also have the rotating roller completely closed inside the belt conveyor. The head chain drive is equipped with a shield, which has greatly improved the safety of maintenance staff. The B6X series belt conveyors are configured with guide chutes and cleaning devices and can be configured with such parts as discharging hoppers, transfer hoppers, service access and ladders, rainproof and dustproof covers, and holdback device according to the actual needs, thus greatly improving customers’ use and maintenance convenience. The B6X series belt conveyors can also customize such special conveying equipment as cold-resistant conveyors as well as corrosion and high temperature-resistant and mobile conveyors according to user requirements and working environment. In order to maximize the stable running performance of B6X series belt conveyors, the equipment in time of design adopted famous brand products in accordance with the international certification standards; its rubber belts use the Zhejiang “THREE V” brand subject to the CE certification with one year’s warranty; its carrier rollers have the design life up to 30000 hours (with the speed lower than 600 r/min) and the damage rate is less than 10% for such carrier rollers during the service life; Siemens (or LUAN) motors are adopted and at the same time the cycloid reducers adopt the GUOMAO brand.